Nestled in a hollow at the base of Second Mountain, we cultivate certified organic veggies on just 1/3 of an acre. We aim to stay small and low-mechanized. To do this, we use an intensive, raised-bed system that directs our labor to building rich, nutrient-dense soil. Fertile soil allows us to plant crops closely and produce multiple successions, making the most of our small space. We use our walk-behind BCS tractor to create beds, and then do much of the subsequent work by hand. We've found that by intentionally staying small and staying on our feet, we can be much more careful, attentive farmers, focused just as much on the health of our soil as on producing veggies. For years we farmed using organic practices, but without an organic certification. In 2018 we decided to pursue organic certification in order to give our customers better clarity on our growing practices and to give ourselves a strong accountability system. This means you can be confident that we're not not spraying with chemical pesticides or fertilizers, that we're using organic, non-GMO seeds, and that we're only using organic inputs to build the fertility of our soil and to feed healthy plants. It means you can be confident that the food you buy from us is good for you and good for the land. Tuesdays and Saturdays at the Harrisonburg Farmers Market. We've focused our growing efforts on producing beautiful, year-round greens, as well as a variety of young, seasonal vegetables. 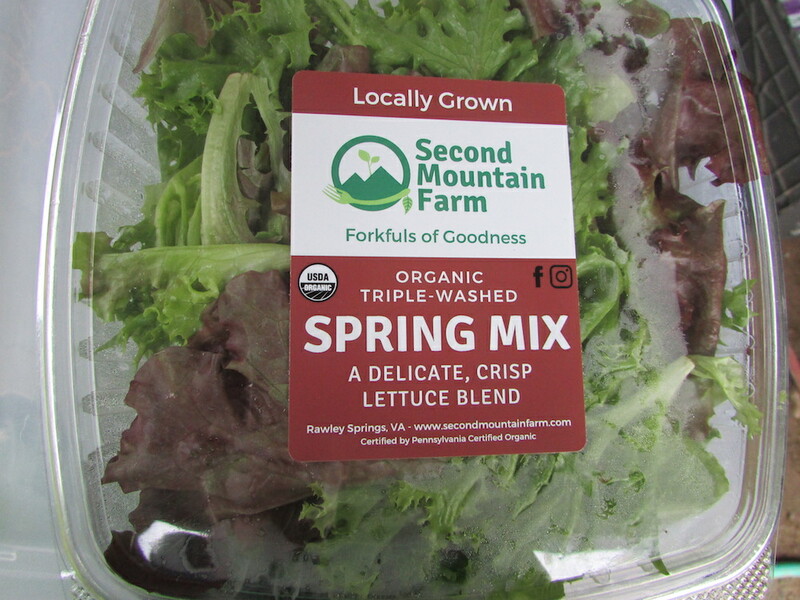 Our greens selections include: Power Mix (baby kale, baby chard, spinach); Mesclun Mix (baby mustards, kale, pac choy); Spring Mix (lettuce blend); Baby Arugula; Baby Kale; and Spinach. Some of our seasonal vegetables include: salad turnips; radishes; baby carrots; baby beets; "lunchbox" peppers; baby cucumbers; cherry tomatoes. We also feature a rotation of these veggies in a kid-friendly "snack pack." Come visit us and try our food at the Harrisonburg Farmers Market! The market is open from 8-1 on Tuesdays and Saturdays, from April-Thanksgiving; and from 9-1 on Saturdays, December-March. We're Krista and Tim Showalter Ehst. We love good food, we love working out in the dirt and sunshine (working in the rain is a little less fun), and we love that our lives are centered on such a beautiful plot of land. We both grew up with big gardens and farming grandparents, but our first 'official' farming experience came after college, when we interned on a vegetable CSA in the hills of Kentucky. We got bit by the farming bug, and have been digging our hands in the dirt in some form or another ever since. Tim ran an urban CSA in Atlanta for a few years while Krista was in seminary, and then we moved to Krista's home area in Southeastern Pennsylvania. There, we ran a diversified CSA from 2012-2017, where we produced seasonal vegetables, pastured meats, and free range eggs. In 2018 we moved with our daughter Anabel to another patch of family land, here at the base of Second Mountain (west of Harrisonburg, VA and just shy of Rawley Springs). We're excited to join the strong network of farmers here in the Harrisonburg area, and to contribute our own growing efforts to this community. For us, growing food isn't just a day job. We've oriented our whole lives around land and soil and place, trying our best to live simply and mindfully. Beyond market gardening, we give our energies to building our homestead: growing as much of our own food as we can; developing sustainable ways to power our lives; tending the woods and pastures and gardens and creek that make up our home in order to nurture a healthy, interdependent eco-system. Krista blogs about our labors and adventures, and we'd love for you to follow along with our story: www.upsidedownhomestead.com.